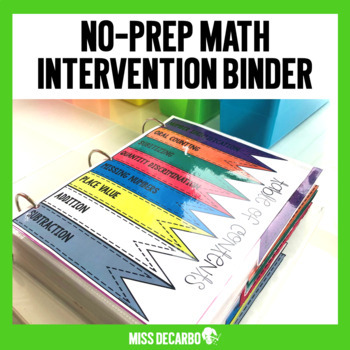 This HUGE intervention binder has over 300 pages of no-prep explicit and intentional math intervention. This binder is ink-friendly because it can be used over and over again with the use of sheet protectors and dry erase markers. Intervention tools will be at your fingertips with your time-saving and effective binder! This is the PERFECT TOOL for RTI! Intervention should be powerful, purposeful, and easy to prep! Downloading the preview is a must in order to get a glimpse of the MANY sections and activities included in this pack!! ** There are over 300 pages of differentiated math intervention activities for you to use with your students! This intervention pack is great to use for practice in between progress monitoring. Please note, this binder was not created for the purpose of assessment - it was designed to provide practice and intervention of math skills. This pack was designed for kindergarten and first-grade students. It could also be used with struggling second graders who are behind grade level in math. 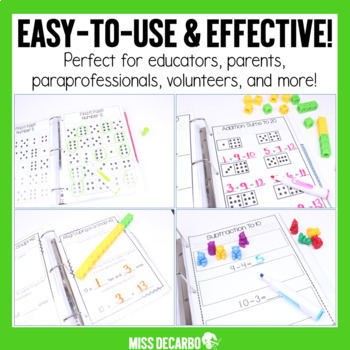 The binder is perfect for special intervention teachers and students. Each page contains directions, making it simple to give to a parent volunteer or aide to work with your students! 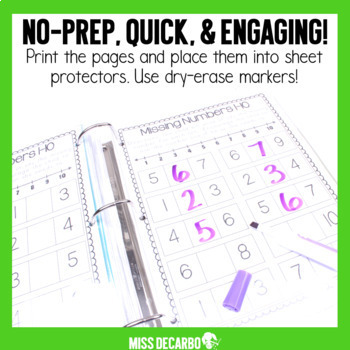 You could even print the pages out for your students to practice at home for reinforcement after you work with them. I pull my kids back one at a time (sometimes in twos or threes) and we work on several pages from a specific section together during our RTI time. The possibilities for using this pack are endless and can be catered to meet your students' needs! I hope you enjoy this math intervention tool as it prepares your students to succeed. I have been using it in my classroom and it has been SO effective and simple to use! My students have truly enjoyed the activities within this page and love getting to work one-on-one with me and in our small intervention groups. Please note: This pack will ONLY be changed or edited in the event of an error. Please feel free to email me with any questions you may have prior to your purchase. :) Thank you! 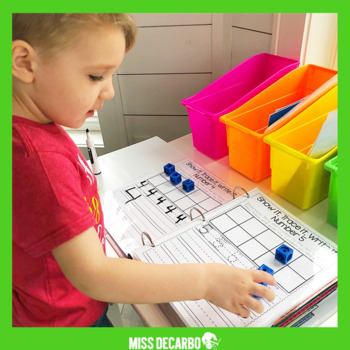 Topics and Areas Covered in this Binder: number identification, number sense, addition, subtraction, place value, quantity discrimination, missing numbers, counting, math practice, subitizing, making ten, etc.